The space rock will pass us at a distance of 126,000 miles, or about half the distance from the Earth to the moon. A fast-moving asteroid the size of a city block will give Earth a close shave on Tuesday, zooming safely past at 6:05 p.m. EDT at a distance of about 126,000 miles. That's about half the distance from the Earth to the moon and the closest approach the asteroid will have made in nearly 300 years, EarthSky.org reported. The space rock, known as 2010 WC9, is moving at almost 29,000 miles per hour and has a diameter of 60 to 134 meters, or roughly 200 to 400 feet — "as big across as a city block," Dr. Erin Ryan, an asteroid expert at NASA's Goddard Space Flight Center in Greenbelt, Maryland, told NBC News MACH in an email. 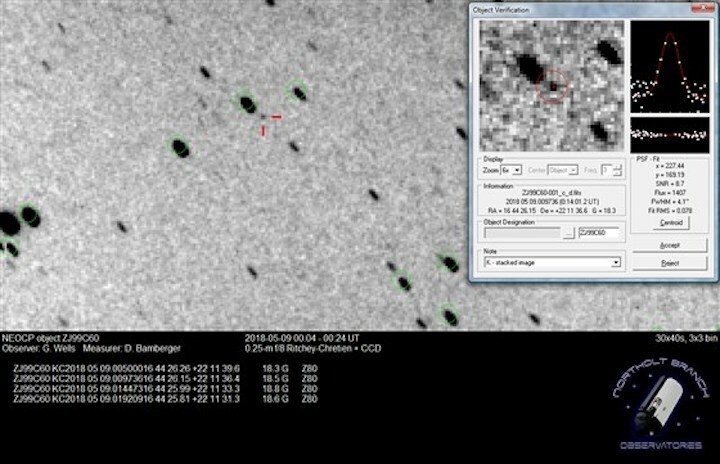 Big as it is, the asteroid is too faint to be seen with the naked eye even during the flyby. But Northolt Branch Observatories, an astronomy group in London, England, plans to livestream telescopic views of the approaching asteroid on its Facebook page beginning Monday night around midnight local time (7 p.m. EDT). Dr. Paul Chodas, director of the Center for Near-Earth Object Studies at the NASA Jet Propulsion Laboratory in Pasadena, California, and a noted expert on asteroids, said astronomers affiliated with the NASA-funded Catalina Sky Survey discovered 2010 WC9 in 2010 and quickly determined that it posed no threat to Earth. "We knew enough not to be worried," he said. But what if an asteroid the size of WC9 were to strike Earth? If it were made of rocky material, Ryan said, it might create a small crater and shatter windows — as happened in 2013, when a meteor entering the atmosphere blew up over Chelyabinsk, Russia. But some asteroids are made of metal, and if one the size of WC9 were to hit us, she said, "you'd get a crater about as big as Meteor Crater." Meteor Crater, about 19 miles west of Winslow, Arizona, is about 4,000 feet in diameter and about 600 feet deep. That might sound scary even to contemplate, but astronomers say there's no need to be overly concerned about an asteroid strike.